McCabe second, the newest and hottest offering in the field of library study spaces, has quickly risen through the ranks to become the darling of most every student at the college. Even in a crowded field, facing tough competition from the social Cornell first and the visually stunning Underhill, the well-lit and expertly designed McCabe second stands out as a first-rate choice. 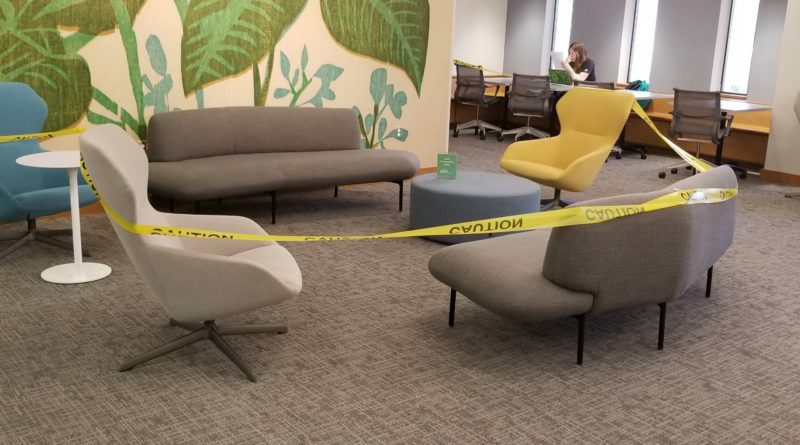 But coming back from spring break, regular guests of McCabe second were unnerved to discover that a section of the floor’s seating area was cordoned off with caution tape, in a scene somewhere between a CSI episode and an Area 51 investigation. The alluringly mysterious auras of the dramatic scene have swirled around the minds of the student body, and with time have congealed into theories regarding the root cause of the quarantine and its possible further implications. Even though the area is currently surrounded by caution tape, students can still reserve it through the online Swat Central portal if they wish to host events there. “It’s a fairly coveted space, with plenty of bright lights and a good central location on campus,” said Director of Events Management Susan Eagar. Students wishing to reserve the space can visit 25live.collegenet.com/swarthmore to see upcoming events in the cordoned off area, and to reserve it for future events of their own.